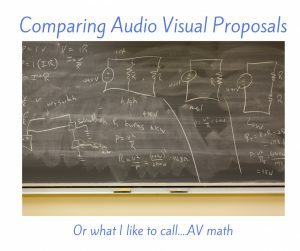 AV Math….comparing Audio Visual Proposals | Details! I sent out a request for proposals for an audio visual company last week and will get the proposals in next week. Because we really pride ourselves on the production values of our events it is critical to me that we have a company who will be a team player, provide superior customer service and really make the event look amazing. But in the world of in-house AV providers, comparing proposals always becomes an exercise in math. And what feels like you are trying to figure out formulas and a new language when comparing them. Here’s my example. A client had a contract that had within the contract fees for using an outside supplier AND a discount for using the in-house supplier. So clearly the hotel was pretty insistent on getting the revenue from us using the AV company. So I sent out an RFP to three providers, including the in-house supplier. Here’s where the math comes in…..you have to add on the outside supplier fees to any outside suppliers, and subtract the discount and add the service charge (and check the order of that) to the in-house supplier. In my example experience, the outside supplier, even with adding on almost $10,000 in fees, was STILL $10,000 cheaper than using the in-house supplier. But of course we can’t just compare the bottom line numbers because AV isn’t like buying oranges at the grocery store. That’s where the new language comes in. You have to look at what they are quoting. How many microphones are they quoting? Is it a mic that can be a lapel OR a wireless handheld but not both at the same time? Are they bringing a sound system or tying into a house system? How big are the screens? And my favourite thing to compare is the lumens on the projector. First of all, did they even include that information? And then if they did – who is giving you the best projector for the best value? Staffing comes into play too. How many staff are they bringing to the event? If you have multiple breakout sessions, are they quoting techs to assist? Or do you have to run around and hope that all your speakers can get set up on their own? There are a lot of pieces to consider within each proposal and what matters most will depend on the event. How much does this all matter? It’s up there in the rankings! Yes people might remember that you didn’t have much food (or bacon! )….but if they can’t hear your message because your audio wasn’t sufficient then why did you hold the event. The key to your event is that people SEE and HEAR your message. Don’t skimp out on your AV! If you need help with your event production, or interpreting proposals, contact us!